First off, the Hip Thruster can be rolled underneath a bed (with just the back pad sticking out) stacked in a closet, or stacked against a wall on the balcony, so you might be okay in that regard. …to see all of the different hip thrust variations. There are so many possibilities now (the link includes over 100 videos of hip thrust variations). With all the different options, you can always be thrusting. We could argue about what type of hip thrust is best, but I suspect that the differences in EMG activation wouldn’t be that significant between all of them. The important thing is that you’re regularly performing hip thrusts. If you have a Hip Thruster, you can do band, barbell, or single leg hip thrusts from home. If you’re at a gym that has a power rack, you can do band hip thrusts out of the rack. If you’re at a gym that has sturdy benches or aerobic steps, you can do barbell hip thrusts. If you’re at a gym that just has a smith machine, you can do smith machine hip thrusts. 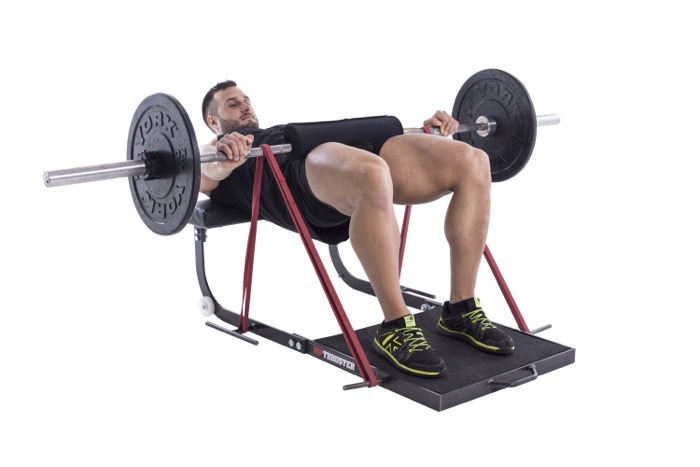 If you’re at a gym that only has leg machines and no free weights, you can do hip thrusts off of the leg extension or lying leg curl machine. If you’re at home or on vacation, you can do single leg hip thrusts or partner hip thrusts off the couch (I’ve had my girlfriend straddle me while I hip thrusted her for 3 sets of 20 reps while on vacation, and I recently told a client to glute bridge her husband for 3 sets of 10 reps when she was on vacation). Band hip thrusts can be performed daily. Barbell hip thrusts can be performed 3 times per week to hit low, medium, and high rep ranges. Single leg hip thrusts can be tossed into the mix once per week for variety. In summary, just make sure that you’re hip thrusting frequently for maximal results. The post Always Be Thrusting appeared first on Bret Contreras.